The night might have been cold, but the crowd gathered for KdV was anything but. It was an overflowing, warm crowd welcoming in the 2010 parade season. KdV didn’t disappoint , with their well made, home made floats, skewering Mayor Nagin, Bill Jefferson, etc; their 17 brass bands & 18 mules; plus their wildly original throws, including golden dreidels, devil match books, Mardi Gras colored, handmade bead encrusted match boxes, and much more. We caught an illegal Saints bath towel- black with a gold Fleur de Lis. I’m in KdV, and it’s an indescribable experience, rolling down the historic streets of the Marigny and French Quarter, meeting and greeting thousands of Mardi Gras and Saints revelers. Yes, it was absolutely freezing last night with a howling wind, but the city and the crowd embraced our parade as they always do and will, and it’s among the greatest feelings in the world. Running into old friends, making new ones, there’s many layers to the fun of Carnival. You could tell the crowd was having a ball as much as the krewe members. Once the parade assembles and starts rolling, it’s 2.5 hours of screaming “Happy Mardi Gras! & “Who Dat!” & “Go Saints!” over and over, and high fiving thousands and thousands of folks lining the parade route. 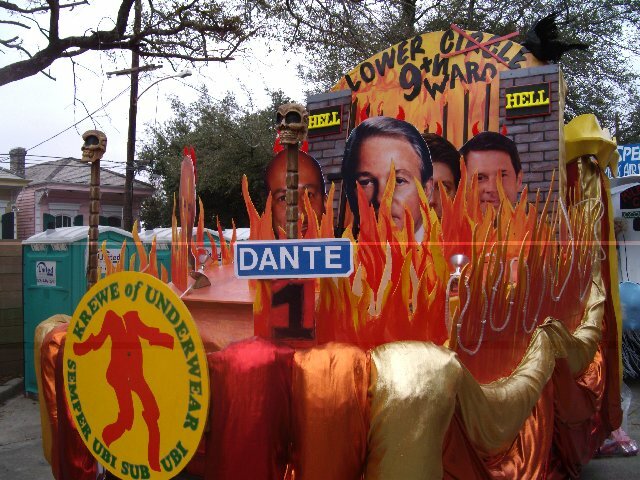 As a Guardian for the Krewe of Underwear, I stood next to my float, guarding it from overzealous fans, constantly checking behind me to make sure the krewe members were keeping behind the float but in front of the marching band. A complete parade unit- band, marching krewe members and donkey pulled float tends to undergo a Slinky-type maneuver as the parade progresses. The 3 discrete units get too close together, then too far apart, imitating a Slinky’s motion. This occurs when krewe members get occupied and slow down to a crawl. The band closes in from behind, and the float moves ahead. The Krewe of underwear’s band last night was Egg Yolk Jubilee. They were terrific, playing a wide variety of marching music. When you high five someone, your eyes meet, and you form an instantaneous Mardi Gras and/or Saints connection that lasts a microsecond, before the next high five begins. It’s a bit of a power grab by the krewe member that only lasts for a moment, since the parade goers want a throw, and only the krewe members have those throws. These moments aggregate over the 150 minutes the parade is on the street and impart a good feeling that lasts a few days. That feeling dissipates slowly over the next couple of days, but each time you remember the experience, that great feeling returns for an instant- you are happy! One notable aspect of the KdV floats that has become much more obvious to the krewe members is how professional the floats construction has become. The sub krewe members decide themselves what their float theme is, what materials to use in construction, and and built it themselves. 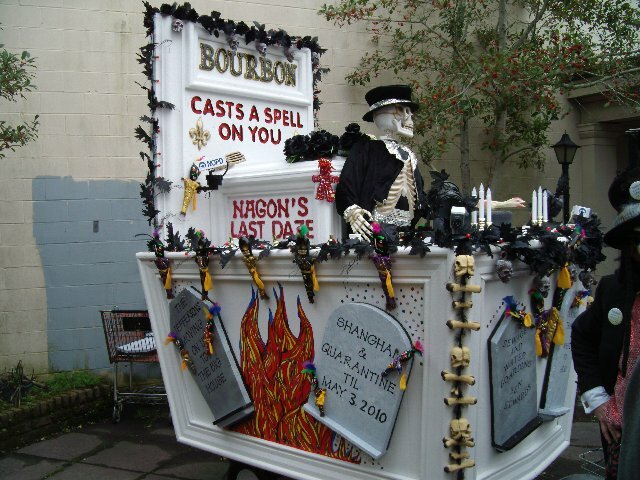 Over the decades, these amateur float builders have learned carpentry, paper mache sculptures making , building & maintaining float carriages, lighting, and any other skilled crafts necessary for their float’s execution. I was positively amazed at how professional in all aspects the finished Underwear float was. Register online or by Fax Download Barkus 2010 Registration Form for all information needed. (PDF file readable with Acrobat Reader; download it free at www.adobe.com.) Fax number on form – 504-522-0239 — For more Membership information click this link. fax/online registration ends 9PM CST, February 6, 2010. The Mystic Krewe of Barkus was envisioned and created in November 1992 at a meeting of the Margaret Orr (WDSU-TV Weather Anchor) Fan Club held at Good Friends Bar. Thomas Wood brought his dog Jo Jo McWood to the meeting, where people complained about her neurotic ways. To get back at them all, Wood decided to make Jo Jo McWood queen of her own parade and captain-for-life. 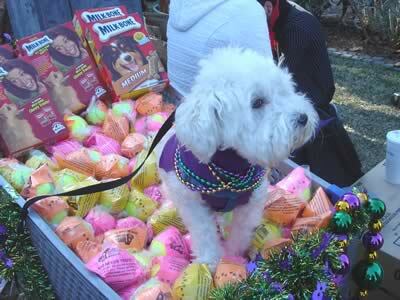 Thus, the Krewe of Barkus was born. No parade uses so many brass bands, no parade uses so many mules, no other parade has such biting satire, marches in the French Quarter, etc. Krewe du Vieux is the most unique parade in New Orleans, and I wouldn’t begin my Carnival Parade Season with any other parade. I love the Krewe du Vieux!! Saints head to the Super Bowl!! Hail Krewe of Zulu Parade! Mardi Gras approaches, and a relatively big local election looms large. On February 6, the electorate will choose a new Mayor, City Council, Louisiana Senate & Legislature, Assessor, among other important governmental positions. The Saints have won their first ever League Championship and the Superbowl comes smack dab in the middle of Carnival- the Super Bowl is Sunday, February 7, and Mardi Gras Day is Tuesday, February 16. Carnival and local elections have mixed before, but the Saints haven’t ever played this late in the season, bringing an extra layer of fervor and hedonism to the mix. My own parade, Krewe Du Vieux, rolls on Saturday, January 30. That adds lots of additional FUN to the proceedings. Let’s not forget Cupid’s holiday, Valentine’s Day, which always falls on February 14. At the time of this posting, the Saints RULE their roost, and it’s a citywide obsession. Therefore, many parading krewes would like to load up on Saints merchandise. However, Saints memorabilia is getting more expensive, not cheaper, making it costly for float riders. Some of the major krewes had the foresight to order Saints footballs, etc. in a timely basis, so they will be throwing highly sought after Saints stuff. Those krewes that parade after Valentine’s Day will load up on 50-75% off sales so you should see plenty of red hearts & arrows coming off the floats. There are 8 parades in the metro area on Election Day. Parades always have a depressing effect on voter turn out. If less people vote, how does that change the outcome? It depends on who doesn’t vote. Motivated voters turn out regardless, therefore it’s safe to assume those that stay home are less motivated than those that take the time to vote. You can count on numerous Saints-themed floats this year, and the stars of the team have become the stars of Mardi Gras 2010. Owner Tom Benson is Grand Marshall of Endymion February 13; Drew Brees is Bacchus on February 14; Sean Peyton is a Celebrity Monarch of Orpheus February 15. 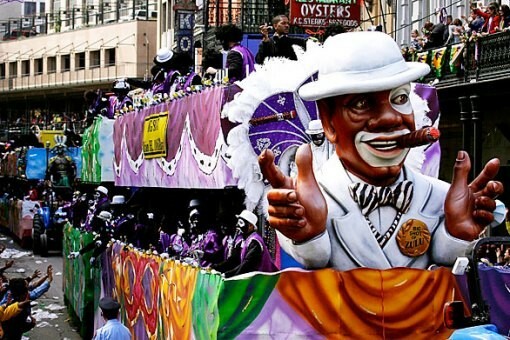 It’s rare that the Crescent City has such a huge success that everyone can enjoy, and many krewes will develop special floats to commemorate this fabulous occasion. An announcement from Endymion said Benson will bring an entourage to the parade, including his wife Gayle, his granddaughter and team co-owner Rita Benson LeBlanc and a delegation of Saints players and staff members. Endymion Captain Ed Muniz said the krewe is having special umbrellas made for Benson, who is known for his umbrella-waving, second-line-style celebrations after big wins. The krewe also said Benson and other riders on his float will throw coins commemorating the 25th anniversary of his ownership of the Saints. Some parades have changed their day or route because of the Super Bowl, and one parade, Rhea in Metairie, canceled. Alla, a big West Bank parade will parade on the day before the Super Bowl. King Arthur and Pontchartrain Uptown are moving their parade up one hour, so they finish before Super Bowl Kick Off. There won’t be a parade in St. Bernard Parish on Mardi Gras this year after all. The Krewe of Gladiators, which was trying to restore its parade, as well as the tradition of a Carnival Day parade in the parish, said it won’t roll. It was too difficult to attact enough riders and krewe officials didn’t want to cause anyone problems by having to possibly cancel the ride closer to Mardi Gras, which is Feb. 16. “I thought we had an excellent shot. But I was not going to put on a parade if we couldn’t do something at least halfway decent,” Krewe Captain Bill Egan said Friday. Egan in recent months had been pushing for new members to join the Gladiators organization so that it could parade on Fat Tuesday. A route had been chosen and cleared with the St. Bernard Parish Sheriff’s Office. Egan had said the parade would start early, so that people could still make parades in other areas later in the day. Gladiators was forced to cancel last year’s ride, as well, due to financial problems and a lack of riders. Egan said the krewe this year wanted to restore the old St. Bernard Parish tradition of having a parade on Fat Tuesday. The parish hasn’t had a Carnival Day parade in nearly 20 years. But in the end, Egan said there wasn’t time to get enough riders to make it worth while.